Traditionally a kitchari dish is a combination of two grains, rice and lentils or dhal, and vegetables and spices. There are many regional variations throughout India and the Middle East, and the dish can be very bland or incredibly rich. This particular recipe is a nice middle-ground so you can explore the basics of making kitchari. You can find this and more recipes in The Hare Krishna Book of Vegetarian Cooking. In Calcutta the devotees hold a Hare Krishna festival at a different city park every weekend. The local people, informed of the upcoming festival, come with generous contributions of rice, dhal, and vegetables, which the devotees transform into a sumptuous “wet” khitchri. The khitchri is first offered to Krishna, and then distributed to at least 5,000 people each weekend. Here is a recipe for that geeli, or wet khitchri. Wash the dhal and rice, soak them for 1 hour, and let them drain. Heat the butter or ghee in a heavy saucepan, add the bay leaves, chopped ginger, and cloves, then add the drained rice and dhal. Fry for about 8-10 minutes, stirring well, until the butter has been absorbed. Stir in enough water to cover the grains by 2 inches (5cm). Add the salt, turmeric and nutmeg, stir and boil for 1 minute. Cover tightly and start to cook over medium-low heat. Lower the heat gradually as the grains absorb the water. Cook slowly for about 30 minutes, checking from time to time to insure that the mixture is always covered with a little water. (If necessary, add a few tablespoons.) Then gently stir in the chopped spinach and tomatoes and cover again. Continue cooking for another 15 minutes, or until the grains are well cooked but the mixture is still quite moist. Mix well before serving. 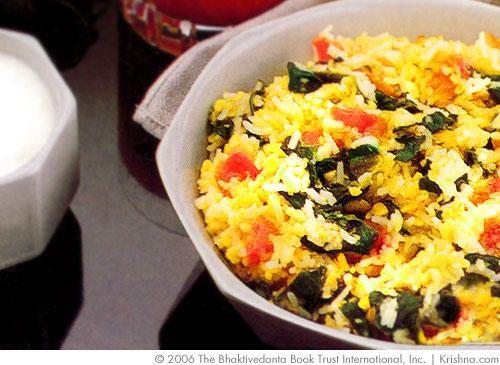 Submitted by Anonymous (not verified) on Sat, 09/03/2011 - 12:14.
please include a basic recipe for upma in the rice/grains section.